The following is a list of shows that we will be attending this year. Selling times are subject to change. You can also go to www.corvair.org and click on "events" or "local clubs" for more info. Clark's Corvair will be set up all day Tues , all day Wed, and Thurs (until 2:30PM) We will have some repros on display and Cheyenne & Nadine taking orders- payments of cash, checks or CC will all receive a discount of 8% off all items ordered at the show. We will have a limited supply of our new 2019-2025 catalogs. 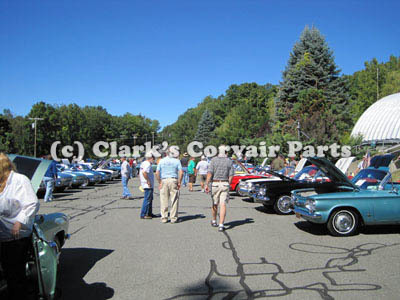 CORVAIR FALL CLASSSIC at CLARKS COVAIR PARTS,INC-Hosted by the Baystate Corvair Club. Car show tours and parts for sale. September 14 2019 no rain date. For 35 or more years we have attended the "CORSA" national conventions and brought over 1000 different parts for you to see and buy. In the fall of 2018, the USA DOT (dept of transportation) changed the rules for business pickups towing trailers. We would now need to comply with nearly 98% of all regs the big tractor trailers are required to follow. DOT regulations require state & federal inspections, permits, road tax, gas tax, special stickers for some states, weigh stations, physicals, driver logs, maintenance records, specific safety equipment, possible large fines, etc. etc.! We are finding it unreasonable for us to learn and comply with all these regulations for 1 or 2 weeks per year. CLARK’S AT FUTURE SHOWS – We will continue to attend the "CORSA" national shows as well as some other shows and will ship repro parts for display. There will be 2 employees with laptops to take orders at a special show discount. We realize the tradition of bringing a large display of parts will be missed and we regret this change but the DOT regs cannot be taken lightly. The pictures below are from our show here in 2010 when we had 102 registered corvair in the show from as far away as kentucky.